One of the best ways to drink fruit juices is with some omega fats from nuts or seeds. This will smooth out the body’s blood sugar reaction to the glucose and fructose in fruits. The PowerGrind Pro juice machine makes it easy to consume fruit juice with nuts because you can make fresh nut milk at the same time you make the fruit juice. Watch our video at the end of this post. Peaches are packed with nutrition as well as great taste. However purchasing the best tasting ones that are nice and sweet, this can be tricky. Peaches with just a little “give” when you hold them indicates they are perfectly ripe. Produce managers do not like customers squeezing their peaches, with obvious reason, therefore you can use smell to tell quite a lot on it’s own. 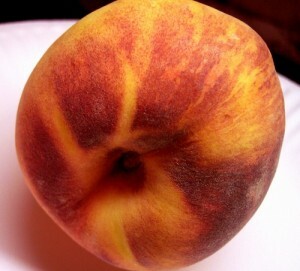 Put your nose right up next to a peach. If it smells sweet and ripe this indicates loads of flavor. One large peach contains only about 68 calories and is dense with minerals like potassium for healthy blood pressure, iron for red blood cells and natural fluorides for bones and teeth. It contains beta-carotene and vitamin C, E and K plus thiamin, riboflavin, vitamin B-6, niacin, folate and pantothenic acid. Looking at the sugar composition, peaches are actually pretty low on the fructose list and about average on the glycemic index and glycemic load scales. There are significant antioxidant properties associated with peaches. A study published in the Journal of Medicinal Food in 2009 is showing major antioxidants in peaches including chlorogenic acid, which helps scavenge free radicals to reduce the effects of aging and deter chronic diseases. This antioxidant has also been shown to help prevent cancer and reduce inflammation. You will also find flavonoids such as lutein, zeaxanthin and ß-cryptoxanthin in peaches. These compounds are indicated to protect against free radicals and have anti-aging properties. Watch our video below with Linda Kordich, showing you step by step how to make Almond Milk With Peaches. 1- cup Almonds, soaked and drained. 1- bunch of red grapes, if needed for added sweetness. BLOOD TONICS…..Are YOU Blood deficient? have you ever had your blood drawn and looked at through a microscope? You will see something quite interesting. Either your red blood cells are plump, round and healthy, or they are distorted, full of parasites or they are not well oxygenated. I am sharing some of the MOST successful green tonics that WILL bring the oxygen back to your blood cells and restore them, creating plump, round, healthy and vibrant. THIS tonic is VERY special. 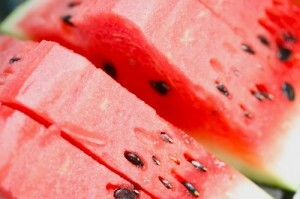 Please try to drink it at least 3 times a week, and daily if you have deficient blood. This is one of the most powerful, super low glycemic TONICS you can take for your blood. We have seen miracles in people’s bloodwork in just weeks. Please SHARE THIS INFORMATION! It is crucial we share this with everyone. Jay Remember, that the human blood is almost identical to the blood of the green plant. 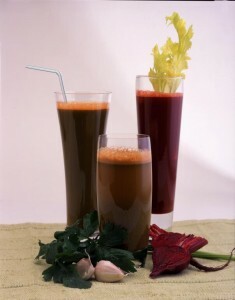 Fruit and vegetable juices are the cleansers, energizers, builders, and regenerators of the human system. 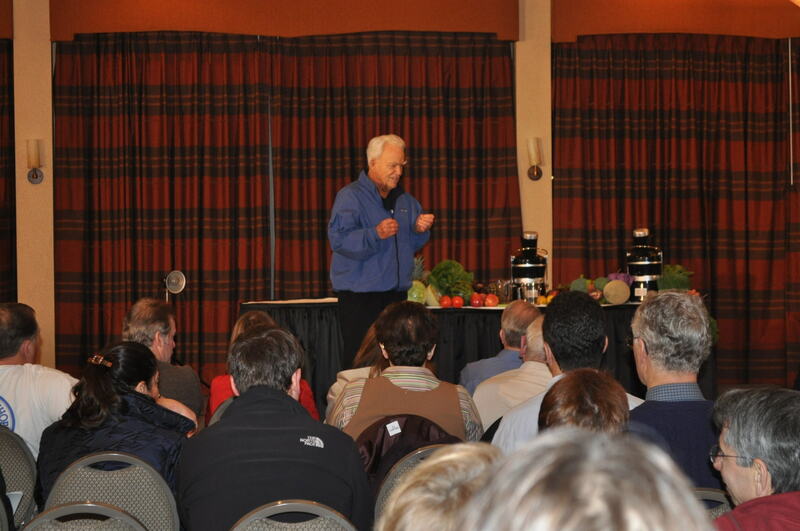 Specifically, fruits are our cleansers and energizers and vegetable juices are our builders, and regenerators. Freshly extracted fruit or vegetable juices will supply all the enzymes, vitamins, minerals, protein, and some fats critical to increased vitality! Adding live juices to one’s diet as a daily routine, many claim brings them a rejuvenating effect and help the disorders such as obesity, cancer, leukemia, arthritis, high blood pressure, kidney disorders, skin infections, liver disorders, alcoholism, and smoking. Supplying the body with easily absorbable nutrients, so that anybody, even with compromised immune sytems or assimilation challenges, juicing penetrates into our intestinal walls, making assimilation almost immediate. 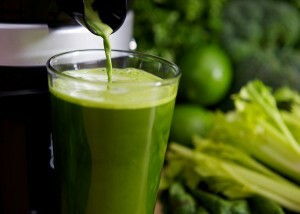 This is because when you juice freshly made fruit or vegetable juices, they are 100% pre-digested. 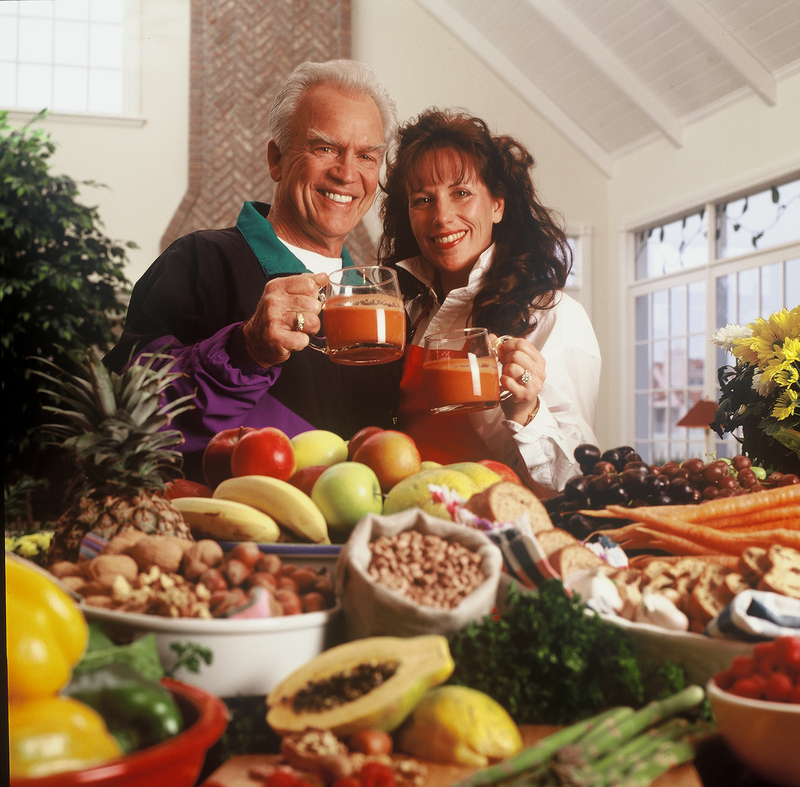 For the elderly, fresh vegetable and fruit juicing is essential! 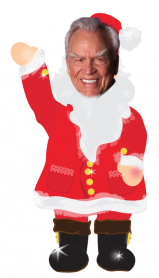 As we age, our assimilation factors decrease due to digestive weaknesses and illnesses we incur as we grow older. Some say that as we reach the age of 70 years old, most of us can only absorb 20% of the nutrients we consume through eating. Not so with juicing. 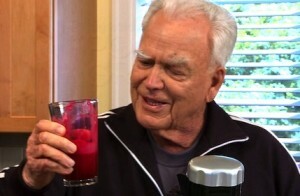 No matter the age, juicing is 100% absorbable. For most health conditions, juice fasting is the best method to transform health quickly and effectively, no matter our age. 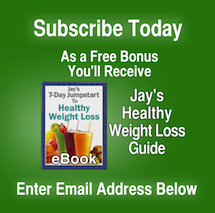 However, as we age, we are also more susceptible to detoxification symptoms as we start to juice more and more power juices such as greens, carrots, beets, etc.,. This is why combining these vegetables helps ease some of these symptoms when we add neutral fruits to the mix such as apples. Through juicing at least 1 quart of power juices daily, thousands of individuals have claimed they have experienced major relief from serious diseases such as cancer, leukemia, arthritis, high blood pressure, kidney disorders, skin infections, liver disorders, obesity, alcoholism and even smoking. Because juice fasting quickly and efficiently removes toxins and excess fatty tissue while supplying a full spectrum of nutrients, (such as antioxidants, phytochemicals, vitamins, minearls, enzymes and micronutrients), it has an advantage over any weight-loss program. Juicing literally –nourishes every cell of our body and floods the body with nutrients that energize the body’s natural regenerative abilities. Here is one of our favourite juice combinations that effectively help our immune system and our overall health ~ at any age! This tonic contains a powerhouse of cleansing properties that anyone can drink on a daily basis, except for children under three years old. 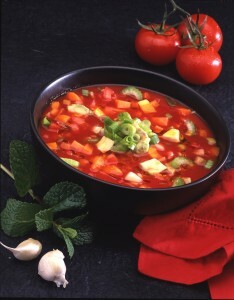 Fresh Gazpacho Soup ~ Living ~ Luscious ~ and Super Easy! Here’s our recipe you guys asked to see! It’s fantastic….loaded with anti-oxidants, Lutein, Enzymes, Phyto-chemicals…. In a large mixing bowl, combine all the ingredients except the avocado and mix well. In a blender, add 1/2 of this mixture and blend until smooth. Pour the blended ingredients back into the mixing bowl. Cover and refrigerate for 3 to 6 hours. Serve cold (summertime only) and garnish with chopped gren onions. The reason why we don’t blend the avocado is because it makes the soup a bit brownish looking as it gets mixed in with the red tomatoes. To keep the integrity of the redness in the soup, you shouldn’t add the avocados for blending, just keep them as they are (diced). Plus it adds for more texture in the soup. Here is our version for the BEST veggie tonic: (for 2) 10 carrots, 6 flowers of Brussel Sprouts, 1 cup Broccoli, 1 large handful of spinach and 2 green apples. It’s a winner! 7. Artichoke (not recommended for juicing!) Best steamed and eaten. Broccoli belongs to the cabbage family (Brassicaceae – to be more specific). The green flower heads and the stalk of the plant are both edible. Broccoli plants are closely related to cauliflowers, although the plants have extremely different colors. Broccoli contains high quantities of vitamin C, soluble fibers and the compound glucoraphanin. Glucoraphanin in broccoli leads to anticancer compound sulforaphane. Referring to the history of broccoli, the plant was first mentioned in France in 1560 (the name “broccoli” is Italian). 150 years later, in England, the plant was still unknown and was called “sprout colli-flower” or “Italian asparagus”. During the centuries, broccoli has became a very popular vegetable. The plant is now mentioned in a lot of TV shows, cartoons. There even is a world contest for eating broccoli. The actual champion is Tom “Broccoli” Landers, who ate 1 pound of broccoli in 92 seconds. The secret, he says, is: “Just swallow, don’t bother to chew”. So, by eating 100 g of broccoli, your body gathers two times more vitamin C as compared to oranges. Also, broccoli has only 0.37 g of fat, while chicken breast and steak have 7 g and 18 g, respectively. Broccoli has almost half of the total quantity of calcium in milk (in 100 g of milk there are 113 mg of calcium, while broccoli has 47 mg). Although it might seem a little strange, broccoli is not seen only as a very healthy and nutritious food. Spinach belongs to the Amaranthaceae family, native to central and southwestern Asia. At the beginning, spinach was cultivated in Persia and in 647 arrived to China where it was called “the herb of Persia”. In the past, spinach was considered to be one of the best sources of iron. In reality, 100 g of raw spinach has 2.7 mg of iron (about 22% of the daily recommended doze for adults), a very high concentration for a vegetable but not as high as people believed in the past. Still, the quantity of iron made available by spinach for the human body depends on its absorption. Iron enters the body in two forms: heme and nonheme iron. All the iron in grains and vegetables and more than half of the iron in animal food sources is nonheme iron. Heme iron can be found only in meat and in smaller quantities. Nonheme iron is absorbed much slower as compared to heme iron. Still, the absorption process is influenced by the presence of other elements, like: binders – fiber, enhancers – vitamin C, etc. So, the good news is that consuming foods rich in vitamin C increases the absorption of iron. However, the bad news is that spinach contains high levels of oxalate, substance that binds with iron to form ferrous oxalate and remove iron from the body (consuming foods with high levels of oxalates will decrease substantially the quantity of iron absorbed by the human body). A funny thing about spinach is that in 1870, Dr. E. von Wolf published an iron content in spinach that was ten times too high. The scientist misplaced a decimal point in his publication, transforming spinach in the most miraculous vegetable in the world. This lead to numerous stories, including the famous “Popey the sailor man”. Still, the truth was revealed in 1937 by a German chemist who corrected the mistake. Besides iron, spinach is also a good source of calcium. Calcium absorption, as iron absorption, is influenced by oxalate. The body can only absorb about 5% of the total quantity of calcium in spinach. Caution: reheating spinach may cause the formation of poisonous compounds that are especially harmful to infants younger than six months. The nutrients in spinach are very important for red blood cell formation, growth and cell division and protein metabolism. It also contains lutein, a very important antioxidant for eye, skin and cardiovascular health. Vitamin C and vitamin A plus the folic acid and fiber help the body fight cancer, especially colon, lung and breast cancer. Spinach also protects the body against heart diseases and against age related memory loss (flavonoids). The Brussels sprout is part of the cabbage family and it is cultivated for its small leafy green heads, much like miniature cabbages. The name of the Brussels sprout comes from the capital of Belgium: Brussels, as it was first cultivated in this country. Today, this vegetable is cultivated mainly throughout Europe and the United States. Brussels sprouts are the most hated vegetable in the UK (according to a survey conducted in the UK in 2002). The main reason for this dissatisfaction with Brussels sprouts is that, when overcooked, the vegetable releases sulphurous compounds that give it an unpleasant smell. Thus, Brussels sprout has become a symbol for all vegetables hated by children. Brussels sprouts are a very good source of vitamin A, vitamin C and folic acid. Also, this vegetable contains high amounts of fiber, potassium and folacin. Brussels sprout is also high in protein, very uncommon for a green vegetable. The phytochemicals in Brussels sprout, like beta Carotene, Lutein and Zeaxanthin help the natural defense system of the body. Brussels sprouts are particularly good for pregnant women, due to its high amount of folic acid. This nutrient is a B-vitamin needed during the cellular division, as it is essential in DNA synthesis. It is known that Brussels sprouts’ glucosinolates help prevent colon cancer. In a study, animals were given water supplemented with Brussels sprouts. As a result the development of pre-cancerous cells was reduced by 41-52% in the colon and 27-67% in the liver. Also, the pre-cancerous lesions in the liver were reduced by 85-91%. There are many ways to cook Brussels sprouts, but it is best to quickly steam or boil it in order to preserve its nutritional value. The main problem when cooking Brussels sprouts is to avoid overcooking in order to prevent the release of bad smells (caused by sulphurous compounds) and loss of nutritious elements. Very popular in the United States, Lima beans are part of the fabaceae family. Their place of origin is uncertain, but it is believed that they came from the South American country of Peru (the capital of Peru is Lima, from witch this vegetable gets its name) or Guatemala. The source of the data is the USDA National Nutrient Database for Standard Reference. Like any other beans, Lima beans are very rich in dietary fiber. Due to this nutrient, this vegetable lowers the cholesterol and prevents blood glucose (blood sugar) from rising to high. This is very useful for diabetics or people suffering of hypoglycemia. The trace mineral, molybdenum, found in Lima beans is a component of the sulfite oxidase. This substance is an enzyme that detoxifies sulfites. Sulfites are preservatives used in salads that may cause rapid heartbeats, headaches or disorientation. People may have sensitivity to sulfites because of insufficient sulfite oxidase. 86.5% of the daily requirement of molybdenum can be provided by a cup of Lima beans. According to the Archives of Internal Medicine, foods that are high in fiber, such as Lima beans can prevent heart disease. A study performed in America (for 19 years) concluded that eating 21 grams of fiber daily, lowers the risk of coronary heart disease by 12% and cardiovascular disease by 11% as compared to eating only 5 grams of fiber every day. The folate in Lima beans also has cardiovascular benefits by reducing the levels of amino acid called homocysteine. High quantities of homocysteine in blood can cause heart attacks, strokes or peripheral vascular diseases. It is known that eating the total daily requirement of folate lowers the risk of heart attacks by 10%. Besides fiber and folate, Lima beans have another nutrient that helps the heart: magnesium. This keeps the veins and arteries relaxed and smoothens the flow of blood through the body. Deficiency of magnesium is often associated with heart attacks. A cup of lima beans can offer 20.2% of the daily value of required magnesium. Combined with whole grain, like brown rice or whole wheat pasta, Lima beans offer about the same quantity of protein as meat or other foods high in calories or fat that could increase your cholesterol level. In fact, a cup of Lima beans has 29.3% of the daily requirement of protein (14.7 grams). Like Lima beans, peas are part of the fabaceae family. Peas come in many forms, each one having a delicious sweaty flavor, a smooth texture and lots of vitamins and minerals. The most common variety of Peas, are the Green Peas (also known as Garden Peas). Peas have a very old and interesting history. It seems that Chinese were the first ones to taste this delicious vegetable in year 2000 BC. Through time, peas spread in Asia and Europe. Also, there are mentions of peas in the Bible and evidence that proves that this vegetable was worshipped in Egypt, Greece and Rome. The great producers of today’s peas are the United States, Great Britain, China, Hungary and India. Peas are quite famous in the genetics community. In the year 1866, the monk and biologist Gregor Mendel published his ideas on heredity. By a selective cross-breeding on common pea plants, Mendel came to conclude his observations in two principles: the principle of segregation and the principle of independent assortment. These two principles of inheritance are today’s modern science of genetics. The high amount of vitamin K1 from green peas makes them very important for your bone health. This vitamin activates a protein called osteocalcin. Without this protein, the absorption of calcium in the bone would not be possible. In addition to the upper mentioned effects of green peas on calcium absorption, this vegetable is rich in folic acid and vitamin B6 that work together to reduce the levels of homocysteine. Besides affecting the cardiovascular health, this amino acid can conduct to poor bones and osteoporosis by obstructing collagen cross-linking. Green peas are an excellent way to increase your energy. The vitamins B1, B2, B3 and B6 from green peas are necessary for the metabolism of carbohydrates, proteins and lipids. The iron is necessary for blood cells. Deficiency of iron can result in anemia, fatigue or a week immune system. Q: Why Juice? There’s not really a great history of people drinking juices in the world. We ate food, so where did juices fit into that pattern, before juicers were invented? A: We have evolved into something that isn’t the original human body, so we have had to use other techniques to keep ourselves healthy. The fact is, we are the only creature on Earth that cooks our foods. In the last 50 years, we have also evolved into eating a preponderance of processed foods, so the body has drastically changed and has been forced to compensate. Throw stress into the mix and we all suffer even more. At one time, millions of years ago, us humans were only munchers. Before there was fire, before there were stoves and cookware, man just ate off the land, because that’s all he had. He had a great digestive tract, and a tremendous enzyme storehouse. There wasn’t any white sugar, Gumbies, Cocopuffs, hormones in foods, pollutants in foods, etc.,. Only Nature. In the very beginning, man also air dried their meat, and once the meat was attracting maggots, they knew it had the enzymes needed for proper digestion and assimilation. Sound gross? Sure it does, but that’s the way to eat meat, if you are going to eat it. To me, I would never touch it. I can find all I need in fruits, nuts, seeds, vegetables, legumes, herbs and soaked grains. Back in those early days of man, he had a working appendix. That appendix had an oily substance to lubricate the colon as you ate, so man could eat large quantities of fruits and vegetables, greens, etc.,. Also the availiability of the nutrients was sixty to seventy percent. Right now some of us are absorbing only 20% of our nutrients from our foods. When the body is digesting any food, just remember, all it is in essence, trying to do, is separate the foods from the juices, so the juices can penetrate the intestinal wall, as it is broken down to liquids. It is only the liquids which permieate through the intestinal wall into the blodostream and through the lier to feed your sixty trillion cells. The fiber, of course, has to be eliminated through bowel movements, yet the fiber plays an important role….our colons need to be cleaned, so this fiber takes care of keeping the 33 feet (from the opening of our mouths to the bottom) of our intestines and colon healthy. This is why JUICING is so imperative for us now, in this day of age, due to the fact we are absorbing very little nutrients from the foods we are eating, compounded by the fact that the foods we are usually eating don’t have much food value in them. When you juice, you are getting 100% of the nutrients from these fruits and vegetables, because they are pre-digested, going into our bloodstream immediately, feeling our 60 trillion cells. THIS is why we juice.